In #Slaviansk #Andreevka district terrorists ask 14 story upper residents to clear levels. Allegedly Anti-Aircraft weapons are brought in. 1. The notorious “Nona” remained partially paralyzed in Sloviansk, but still shows signs of life in the hands of terrorists. Terrorists loaded the self-propelled mortar, shot down by security forces, into a trailer and continue to haul it from one position to another in the residential areas of the city. Last night, a [Ukrainian] security forces checkpoint was shot at by fire from this gun. 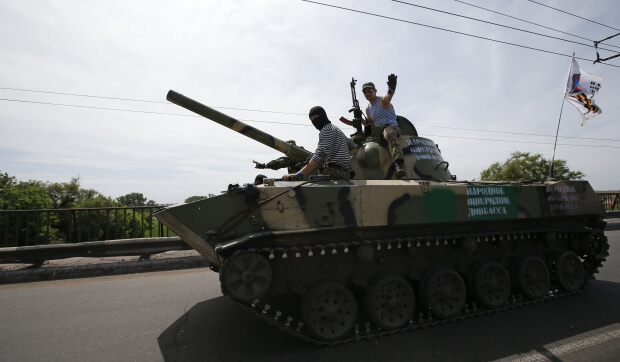 Also, insurgents fired from “Nona” at a local children’s hospital and at residential buildings. 2. In only the past two days, eight soldiers of the National Guard were killed. 3. Well, here is something not necessarily from the bad, but sooner from the ridiculous and the insane. The Investigative Committee of the Russian Federation initiated a criminal case against the Ukrainian military under the Article: “On the use of prohibited means and methods of warfare.” As in, Ukraine is conducting its ATO in the wrong manner, [by being] too tough on terrorists. 4. By the way, polls show the same. The Russian “Levada Center” confirms: over the last month, the number of people in Russia who have a bad attitude towards Ukraine almost doubled–from 25% of Russians in April to 49% now. Putin propaganda in action. 1. Ukrainian border guards are becoming more active. Today, they prevented the entry of arms cargo from the territory of Russia, and detained Russian “volunteers.” Meanwhile, the State Border Service is currently negotiating with the Ministry of Defense and the National Guard to strengthen border units on the border with Russia. And it’s not just talk. According to our data, the redeployment of a number of the Army and [National] Guard units to reinforce the Border Service is already underway. 2. The Dnipro Battalion and the Terroritial Defense Battalion of Dnipropetrovsk Oblast [region] currently have under full control several railway stations in the area, as well as all border railway stations. 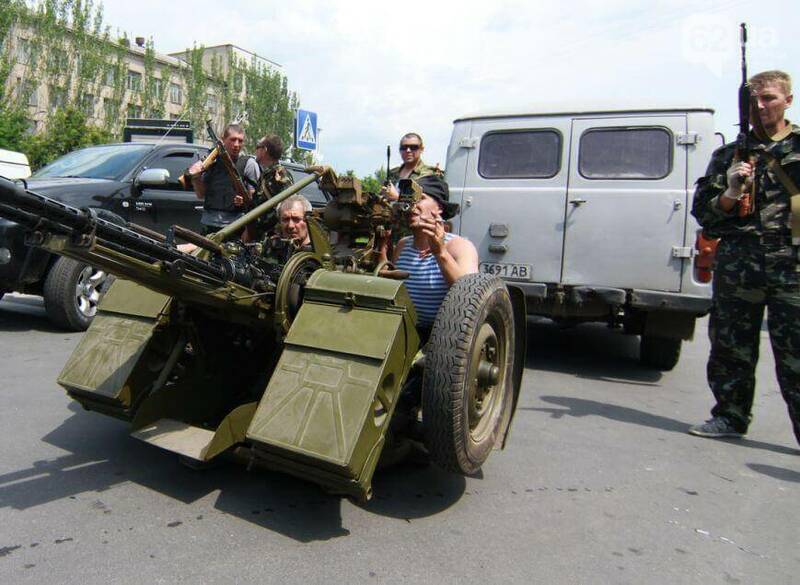 #Donetsk, #Ukraine, pro-Russian battalion “Vostok” has installed antiaircraft gun in front of State administration. 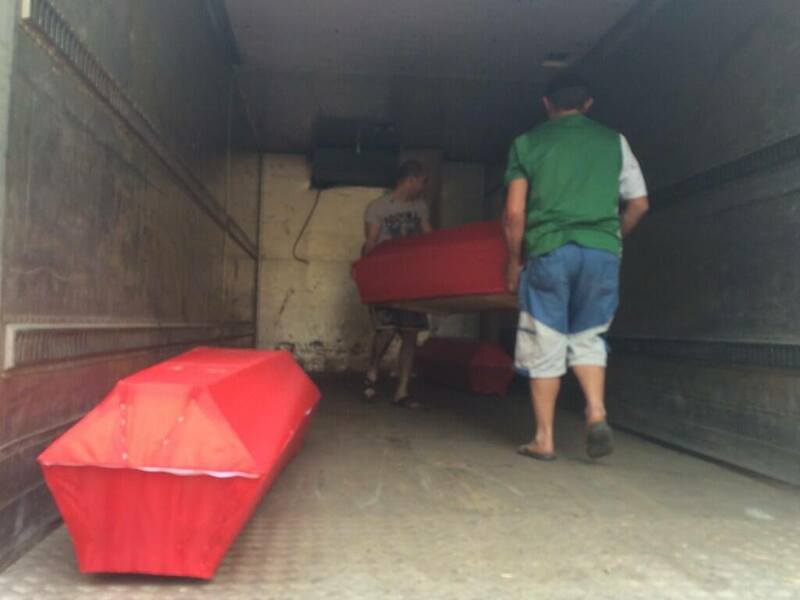 DPR leader Borodai: 33 dead Russian fighters identified, to be taken from morgue to Russia, then Rostov to be buried. 1. 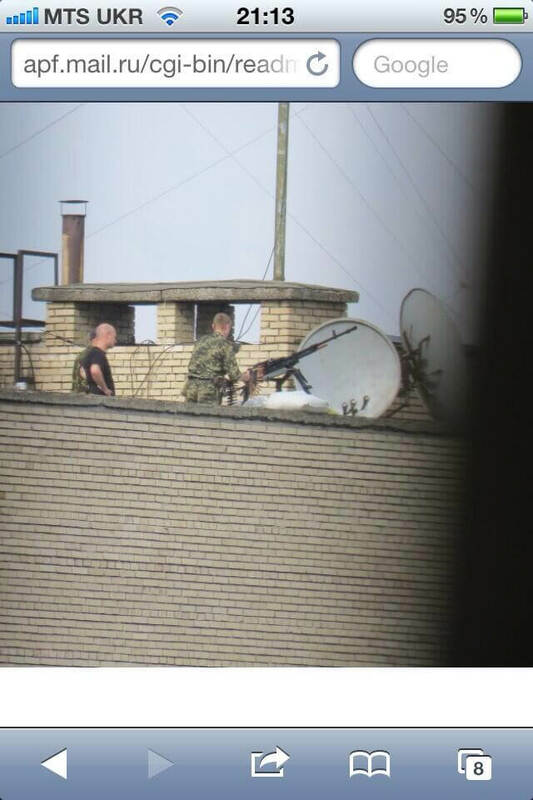 The ATO Mi-8 helicopter was shot down near Sloviansk. Six soldiers of the National Guard and six soldiers of [former] “Berkut” special ops team were killed. Later, a convoy of ATO forces was under fire in Kharkiv Oblast [region] near Izyum; as a result, one soldier was killed. A group of terrorists who shot down the helicopter was immediately destroyed. Terrorist-killers who attacked the convoy have escaped. I believe that every jerk from terrorist groups in Donbas will answer in full for their crimes. And I believe that very soon the hour will come when Ukrainian land will finally cease to be a territory of death and a territory of revenge. 2. Essentially Russia has officially announced that it supports terrorism. No comment. Official aid to terrorists is so in the spirit of the Kremlin. As for military assistance, by the way, Peskov shouldn’t be shy about it–how [assistance] and how much of it is granted by Russia to the terrorists in Donbas, Ukraine knows perfectly well. 3. During the period from May 9 to May 28, seven children in Donetsk Oblast received wounds of varying severity as a result of armed fighting. This was reported by the Healthcare Department of the Donetsk Regional State Administration. When children suffer–it’s the height of atrocities that any human can commit. Children’s pain and blood will never be forgiven the terrorists. Neither in this, nor in a better, world. 1. The ATO Headquarters put the dot on the “i” about the fighting in Sloviansk. Today security forces didn’t carry out any operations in this area. The town is blocked, and the constant armed battles in its territory are nothing more than a showdown between the terrorists themselves. The faster these spiders in a jar gnaw each other, the better. If only residents didn’t have to suffer during it. 2. According to Defense Minister M. Koval today, a number of public officials from the Ministry of Defense [of Ukraine] were suspended from duty for abuse [of power] during Army provisioning. Their cases have been handed over to the Prosecutor’s office. We can only welcome the Army cleansing process. After all, the military office (alas, not only this one) is infested with corrupt officials. However it is unclear why, whenever one looks at the Defense Ministry and the General Staff today, they would come across leeches from the teams of [Mykhailo] Yezhel or [Dmytro] Salamatin or [Pavlo] Lebedev. Why the crowds of Yanukovych figures are still hanging around there is unclear. Especially when it concerns positions related to the distribution of resources and cash flow. Does anyone really think that after Maidan, yesterday’s thieves who plundered the Army for four consecutive years have dramatically rehabilitated themselves? What a strange naiveté. 3. In Donetsk, the terrorists from the so-called “Vostok” [East] Battalion showed up today to the main “cabin” of Donetsk by the name of the Donetsk Oblast City Administration [DOCA]. But the “cabin” was occupied. There were already more nimble kids from the “DPR” accommodating themselves there. Russian “volunteers” from the “Vostok” battalion, with the typical appearance of people from Caucasia, started arresting kids from the “DPR.” Allegedly for stealing chocolates and beer at the looted supermarket “Metro” and refusing to share. Press-Officer ATO Dmitrashkovsky: UA forces shot down drone made in #Russia which was circling over #Ukraine military positions in #Donetsk. This entry was posted in News & Views on May 31, 2014 by RomanInUkraine.